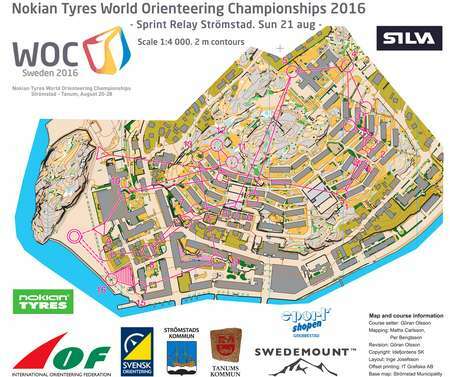 The World Orienteering Championships Sprint Relay was a tight battle between Denmark, Switzerland and Sweden. In the end Denmark’s super-sprinter Maja Alm decided the relay for Denmark for the second year in a row after having been served a perfect start position by her teammates Cecilie Friberg Klysner, Tue Lassen and Søren Bobach. 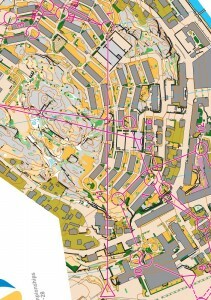 Denmark’s runners all did very stable technical performances. 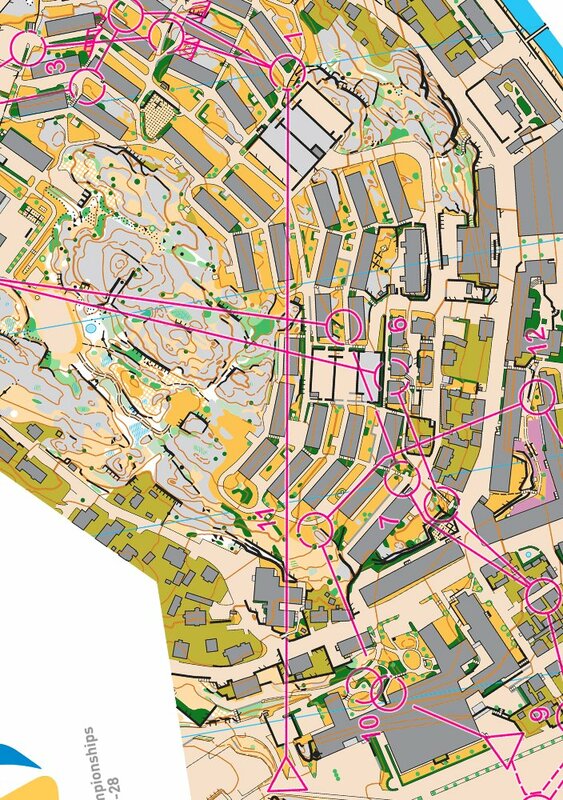 Cecilie Friberg Klysner and Tue Lassen ran excellent on the first two legs and served Søren Bobach in a perfect lead position at the start of the third leg. Bobach lost some time to Sweden, but still managed to keep a safe gap to the toughest contender Switzerland – enough for last leg runner Maja Alm to run in to a safe victory. The above race development graph shows the how the race developed for the Top 6 finishers at a glance. 10 different situations are marked on the illustration with the letters A to J; these situations will be explained further in the following. Leg 1: At point A Denmark’s Klysner (red) and Sweden’s Lina Strand (blue) have a shorter forking than Switzerland’s Rahel Friederich (green), a gap which Switzerland never really manages to close throughout the leg (Switzerland’s Wyder uses it to get closer to Maja Alm on the last leg, though). Sweden is in the lead after the leg with Denmark and Switzerland within 10 seconds. 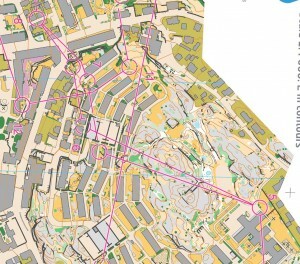 Last year’s silver medalist Norway (light blue) loses 25 seconds due to a parallel mistake towards the end of the race (point B) – and is now out of the fight for the victory. Russia is disqualified on the first leg due to a missing punch. Leg 2: Switzerland and Denmark get contact with Sweden towards the first control. Then Switzerland again has a long forking while Denmark and Sweden had short forkings (point C). Sweden thus loses around 10 seconds and contact with the two leading teams. Two long forkings for Switzerland means around 20 seconds lost – and Switzerland is actually the “virtual leader” in the race – but can the two last leg runners exploit the situation? The rest of the leg Denmark’s Tue Lassen runs a very good leg, gradually increasing the gap to both Sweden’s Gustav Bergman and Switzerland’s Florian Howald (point D). Leg 3: On the third leg Denmark’s Søren Bobach gradually lost time to Sweden’s Jonas Leandersson both having the same long forking. 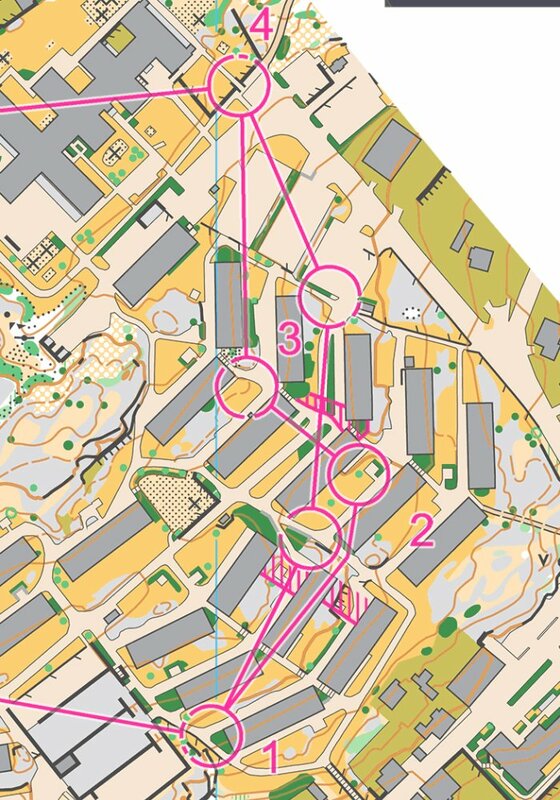 Meanwhile Switzerland’s Martin Hubmann with the short forking did not manage to use the advantage to get closer to the leaders (point E), the gap still staying at nearly 20 seconds. In the meantime Kris Jones runs a very strong leg for Great Britain (point F), bringing Great Britain from “nowhere” into the medal fight. Towards the end of the leg Martin Hubmann takes a wrong route choice (point G) just when he was close to closing the gap to Denmark – crucial for the Swiss team who could have got a perfect position ahead of the last leg. At the end of the leg Sweden had a 12 second gap to Denmark with Switzerland another 18 seconds behind. Leg 4: On the last leg Sweden’s Helena Jansson was significantly slower than the other top teams in the start – Jansson being caught by Denmark’s Maja Alm already before the first control (point H) and by Swiss Judith Wyder before the 4th control. At the first forking Switzerland has the short forking and catches 11 seconds on Denmark (point I) – this could have been where Switzerland got a gap if Hubmann would have run a perfect 3rd leg. Instead Wyder is still behind, but with an 8 second gap, the smallest gap during the last leg. Wyder loses some more time towards the end of the leg (point K), and Alm can celebrate a clear victory for Denmark. In the battle for bronze Great Britain’s Cat Taylor has a good start of the race, getting very close to Sweden’s Helena Jansson, but loses a lot of time on the second long leg (point J). The forking between the first and fourth control opened up more gaps, though. The same was used on all legs, but women forked against women and men against men (as is intended). The short forking (to the right) is around 10 seconds shorter than the long forking – this is a lot in a Sprint Relay where forkings should be as equal as possible in order to not introduce unfairness. The 10(!) fastest on these leg have the rightmost forking (shown in blue) – the fastest on the lestmost forking is Ward from Great Britain who loses 9 seconds (all runner choosing the left are shown in red). For the other legs the time difference was even bigger for this forking. 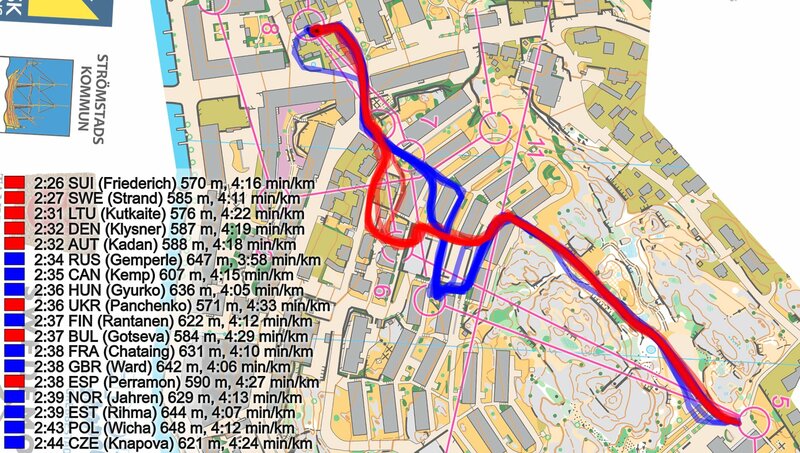 The second forking was more equal between the two variants, and many different routes were ran. At first sight it may look like you lose time by taking a routechoice to the right for the leftmost control, but if well executed you can run just as fast to the left, right and even across the hill for the leftmost control. Several runners lost some time due to non-optimal execution here, though. For the rightmost control you need to take a routechoice to the right to not lose time. 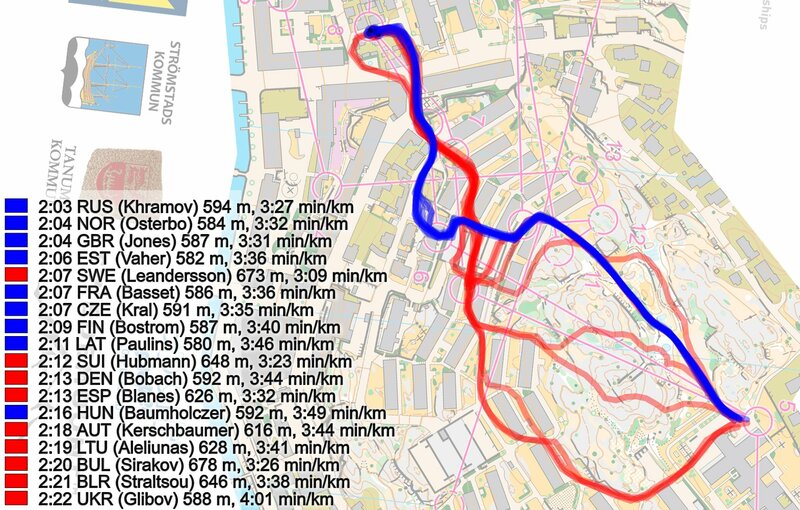 Quite a few runners lost time on this leg, partly due to choosing non-optimal routechoice for their leg, and partly due to the uphill character of the leg. If you had the rightmost leg, you lose time by going left (e.g. France’s Basset, Denmark’s Lassen and Switzerland’s Hubmann). For the leftmost control the picture is more complex, but also here some runners lose significant time by taking non-optimal routes (e.g. Denmark’s Bobach). According to the Sprint Relay winsplit results, Russia was disqualified because of a missing punch on control 13-122. On the TV coverage, we can see Gemperle punching above the control. She punches high, but not higher than she does on control 8 for example. I guess athletes have full informations about the air punching system and its limits. Therefore they must adapt their punching technics to the system. Nevertheless, after such a good race and not showing an intentional cheating, disqualification seems harsh to me. Did you ever write an article about those air punching systems ? Can you post some links ? Thank you.